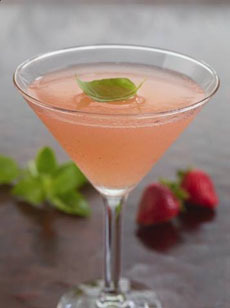 Here‘s a “berry” summery drink: a Strawberry Basil Gimlet. We were inspired by this photo from Ruth’s Chris Steak House to make a batch yesterday. *If you’re not a gin fan, you can substitute tequila or vodka; or use a sparkling wine like Prosecco. It just won’t be an official gimlet. 1. MUDDLE the strawberry and basil leaves in a cocktail shaker with simple syrup. If you’re making multiple cocktails, it’s easier to purée. 2. ADD gin, lemon juice and ice, and shake well. 3. STRAIN into a rocks glass with ice. Garnish with a basil leaf and large berry, notched onto the rim. A gimlet is a tool for drilling small holes; the name was also used figuratively to describe something as sharp or piercing. The word “gimlet” for a cocktail was first used around 1928—perhaps for its effects on the drinker. According to Wikipedia, another theory is that the drink was named after British Royal Navy Surgeon Rear-Admiral Sir Thomas Gimlette KCB (who served 1879 to 1913). Forget that, Chandler: You may be a great fiction writer but nothing is better in a gimlet than fresh lime juice. If you want to use a lime juice cordial like Rose’s, here’s a homemade lime juice cordial recipe and the reason why you should make your own.